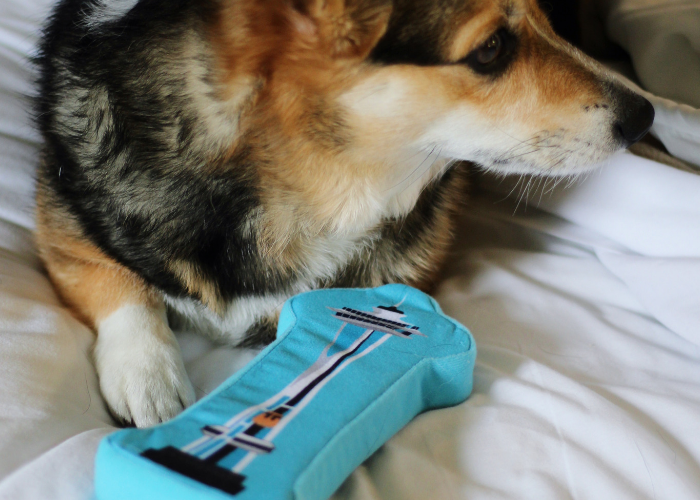 Planning a trip to Seattle with your four-legged best friend? 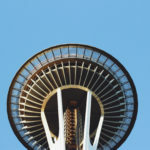 We have all of the best places to go in this Dog Friendly Seattle Guide. Do you travel with your pup? We do. Our dog, Cocoa, loves to travel and go on adventures. She’s been across country twice and loves a good road trip. She really loves exploring new places. We try to always bring her on nature-focused trips—her favorites being a cabin in the middle of the woods in Bend, Glacier National Park, and pretty much anywhere she can hike (she loves hiking, don’t be fooled by her short legs!). Cocoa has a ton of anxiety and does not do well with being boarded. Unfortunately, we have no family here and have had to board her a few times (she is not. happy. when this happens). But we mostly try to bring her when we travel, if we can. I know that it can be stressful to travel with pets sometimes. 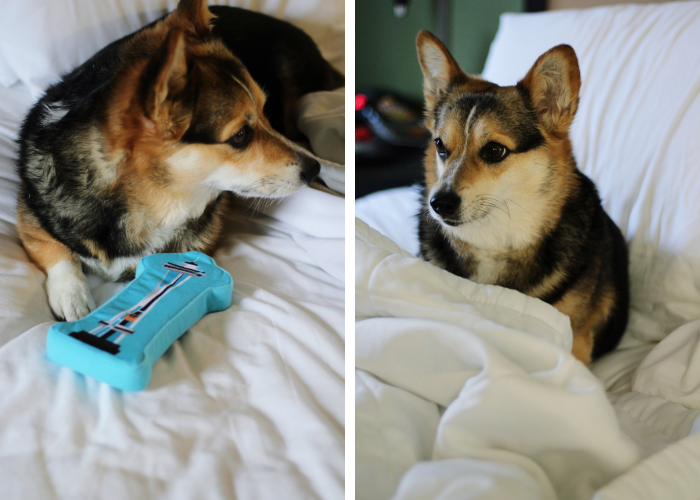 Finding a dog-friendly hotel, paying all of the extra fees, finding dog-friendly places to eat, having anxiety about leaving your dog in the hotel room. I understand. I decided to write this Dog Friendly Seattle Guide because a lot of people ask me for dog-friendly recommendations in Seattle and Portland. Luckily, I think it’s pretty doable to have a great trip to Seattle with your pup in tow. A lot of Seattle hotels, restaurants, parks, attractions, and breweries are dog-friendly. Additionally, you can also do some fun and unique things with your pup: take them to a baseball game, go kayaking, even ride a bus! 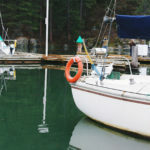 Here are my top tips for planning a dog-friendly Seattle vacation. Where to eat, stay, drink, and play in Seattle with your four-legged friend. There are a lot of dog friendly Seattle hotels, from budget to boutique. Finding a pet friendly place to stay shouldn’t be a problem. Pay attention to pet fees, house rules, and location. For us, Cocoa doesn’t do as well at a very crowded spot or one directly downtown. I like to stay at one of Extended Stay America’s properties. They are quiet, close to downtown, and have lots of grass for Cocoa to sniff. They also have fully equipped kitchens and work spaces, which are very convenient. Especially since Princess Cocoa needs to eat refrigerated fresh pet food. Pet fees are reasonable and the staff is always friendly. These are the best Seattle spots for your pup to run, sniff, and play. Seattle offers 14 off-leash dog parks perfect for your pup to burn some energy. 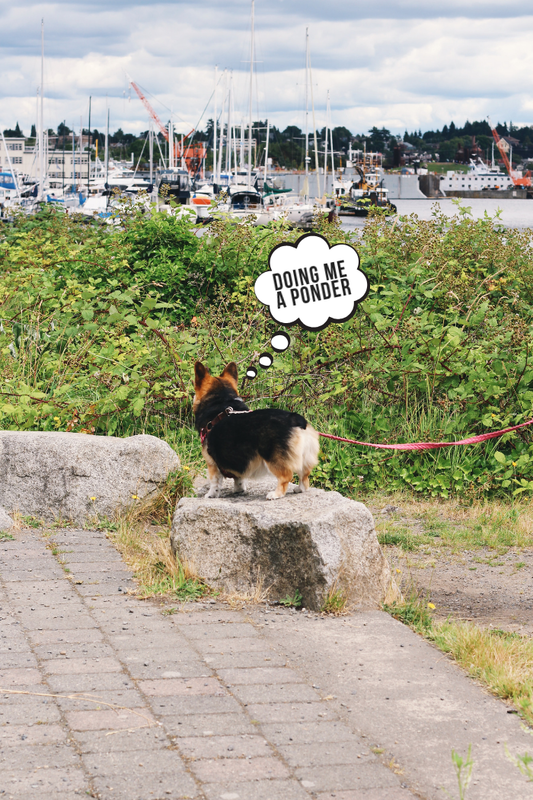 Local favorites include Golden Gardens and Warren G. Magnuson Park, which includes the city’s only dog-friendly off-leash beach. Besides off-leash dog parks, your pup can head to one of Seattle’s gorgeous city parks with you. Washington Park Arboretum is a great choice. It’s free, dog-friendly, and includes 230 acres of gardens, walking trails, guided tours, and picnic-perfect spots. House of Ruff is the perfect place to socialize both you and your dog. The “Indoor Canine Social Club” has a large, climate-controlled indoor dog park that’s ideal for that typical overcast Seattle weather. Their Ruff Lounge allows your dog to play, run, and socialize with other dogs while you have a beer. Ruff Lounge also hosts events like Sunday Sunrise Tacos and Seahawks game viewings. Just be sure to check out their requirements, like membership and behavior assessment. Greenwood’s Voff Bark & Brew is similar to Ruff Lounge, but better suited to visitors opposed to residents. For a small entrance fee, your pup can enjoy the huge yard to play in, equipped with pools to splash in and toys to chew. There’s beer on tap, wine, and cider to enjoy, as well as trivia nights and outdoor movies. Take a peek at their house rules so you come prepared. Getting hungry? Grab a seat at one of these dog-friendly Seattle eateries. 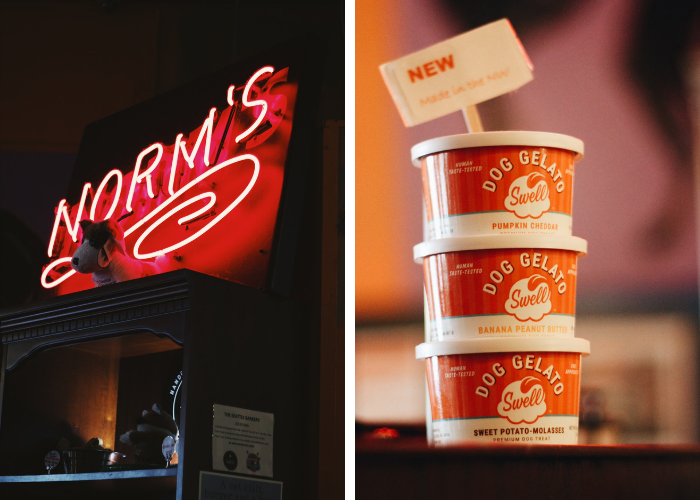 Norm’s is probably the most dog-friendly restaurant in all of Seattle. 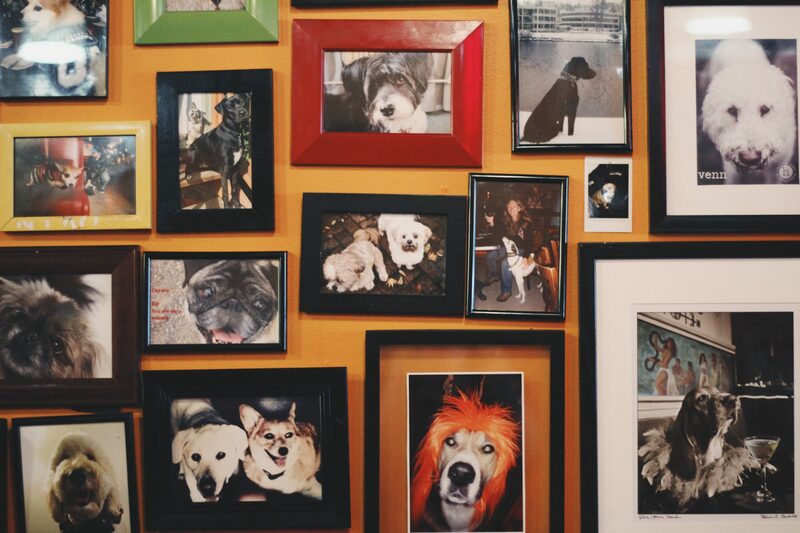 Everything is canine-themed here, from the dog photos hanging on the wall to the full dog menu. You can enjoy wings or a burger while your pup snacks on turkey nuggets, Bow Wow Bowls, and dog-friendly cupcakes or ice cream. Norm’s also has plenty of fun events, like happy hour, bingo, and trivia nights. Dogs are allowed inside here, so it’s the perfect dog-friendly Seattle spot for cold, dreary days. 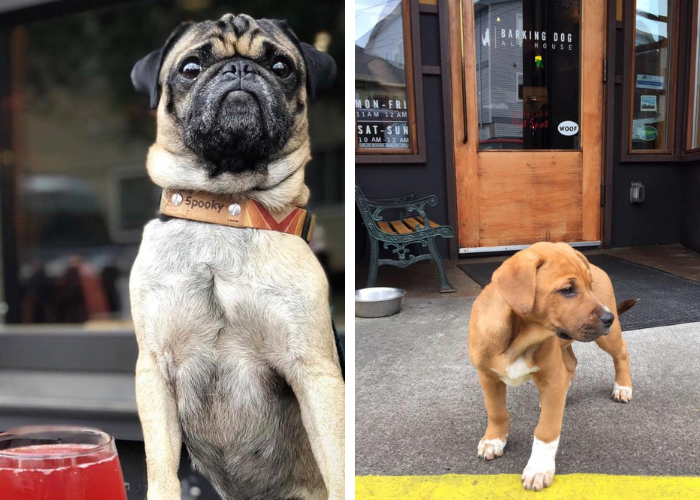 Portage Bay Cafe is one of Seattle’s hottest brunch spots, and dogs are welcome! You can dine with your pup on the cozy, covered outdoor patio at the University District location. Portage Bay is popular for their Breakfast Bar, which includes all of the goodies you can imagine for topping your pancakes and waffles. You may be able to tell from the name, but Northgate’s Bark Espresso is very dog-friendly. Come to Bark to curb your caffeine craving and grab a snack or pastry for yourself and a Pooch Latte for your pup. You can bring your pet inside, but there are two separate sections so pay attention to the dog-friendly seating. At Pike Place’s The Pink Door, you can enjoy one of Seattle’s most popular restaurants without leaving your pup at home. Dogs are welcome on the outdoor terrace which overlooks Elliott Bay. The Pink Door is known for their Italian cuisine and serves both lunch and dinner. Come rest your paws at Fremont’s The Leary Traveler. Pups are allowed inside and out at this Fremont neighborhood pub. 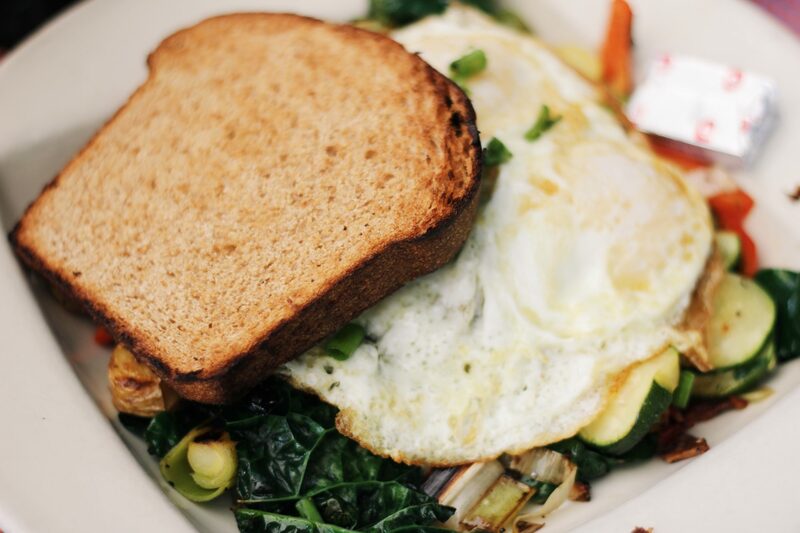 Whether you come for brunch or dinner, you’ll find plenty to eat (and drink) on Leary’s full menu. 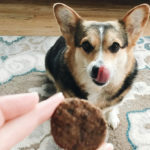 Your dog deserves a treat, too! 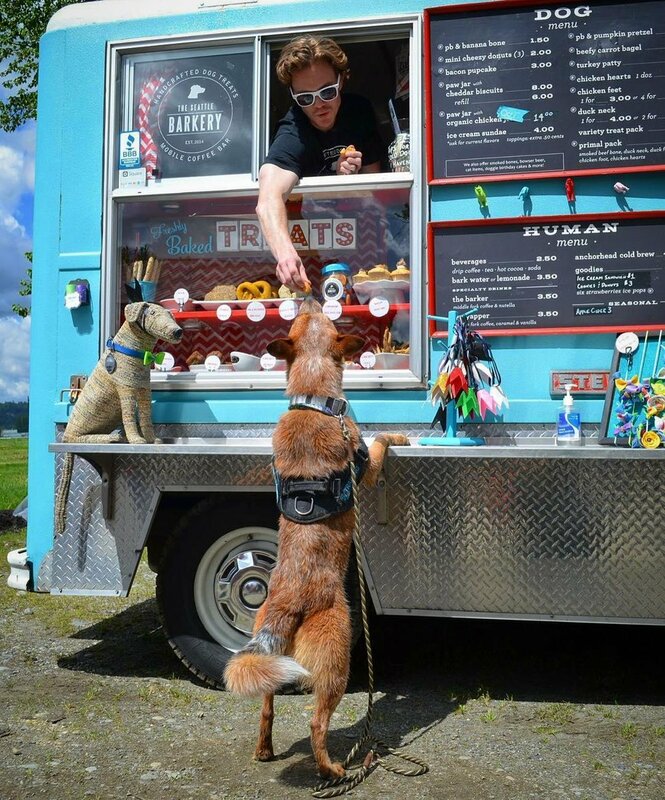 Hunt down Seattle’s dog treat food truck, Barkery. Perhaps the cutest food truck I’ve ever seen, your pup can get all sorts of homemade goodies here, from cheesy donuts to ice cream sundaes. And don’t worry, there’s stuff for you, too (like specialty coffee drinks and pastries). South Lake Union’s Nollie’s Cafe not only welcomes dogs inside, but knows most of its canine “regulars” by name. This cozy cafe serves a delicious breakfast or lunch, with options from biscuits and gravy to vegetable curry. Don’t leave without something from the bakery case. Ballard’s Kiss Cafe is another Seattle establishment that allows pups inside its doors. 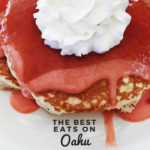 This no-frills cafe is loved by locals and serves up classic sandwiches and breakfast all day. 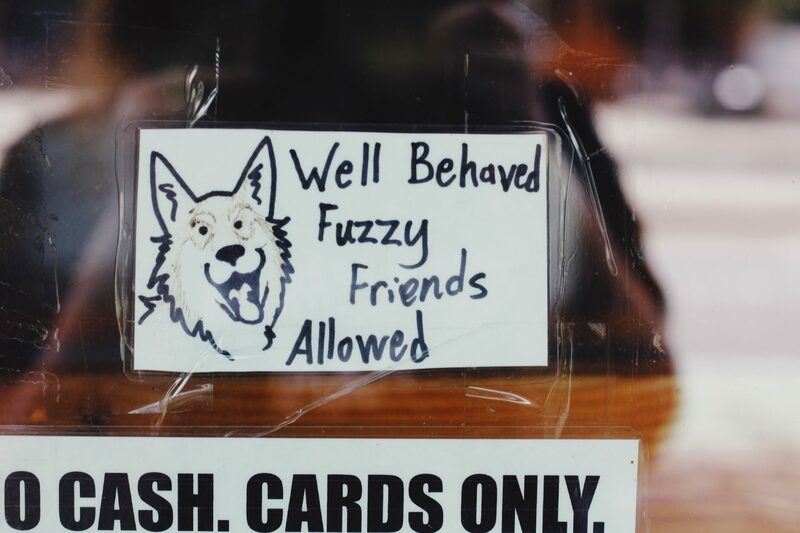 Another beloved Ballard bar, King’s Hardware, welcomes both you and your pet. King’s offers a great outdoor patio, Skee-Ball, and a full menu. Burger fan? You’ll be very happy here with King’s ten specialty burger options, from the spicy Five Alarm Burger to the peanut butter and bacon-topped After School Special. If Cuban food and canines are your thing, Green Lake’s Bongos is the place to be. This dog- and family-friendly restaurant is one of the liveliest places to be in Seattle’s summer months. Dig your toes in the sand (Bongos’ floor is made from it) and enjoy Cuban dishes like Ropa Vieja and Picadillo. Pull up a seat and stay awhile at South Lake Union’s LOCAL Public Eatery. LOCAL offers a nice happy hour and a full menu in addition to beer, wine, and cocktails. With a name like that, it’s no surprise that Phinney Ridge’s Barking Dog Alehouse is pet-friendly. A quick trip to their Facebook page will show off dozens of their four-legged regulars, like @PugAndABeer. Barking Dog offers a full menu and a constantly changing, carefully crafted beer list. 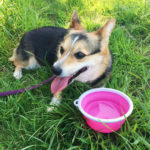 Looking for more dog friendly Seattle restaurants? Check out Cafe Pettirosso, Both Ways Cafe, Le Pichet, Highliner Public House, and Meet the Moon. Quench your thirst at one of these dog-friendly Seattle breweries and bars. West Seattle’s Ounces Taproom & Beer Garden serves up brews in a “comfortable, yet trendy indoor/outdoor space open to all ages (and pets).” They offer a rotating tap of Washington-made beer, cider, and wine. Ounces doesn’t serve food, but you are welcome to bring your own food, order delivery, or order from one of their rotating food trucks. This Pike Place wine bar is cozy, laid-back, and dog-friendly. You can bring your pup inside The Tasting Room and enjoy friendly service, wine flights, and appetizers. I’m a big fan of the sparkling wine flight. Capitol Hill’s Optimism Brewing is a favorite among both locals and pets. Locals love their beers and family-friendly space, and the pups love the heated concrete floors! Looking to play a round of mini-golf with some brews? Flatstick Pub has you—and your pup—covered. Dogs are allowed at the Kirkland and Pioneer Square locations. Besides indoor putt-putt, there’s Yappy Hour, “Duffleboard,” trivia, and bingo. Fan of cider? 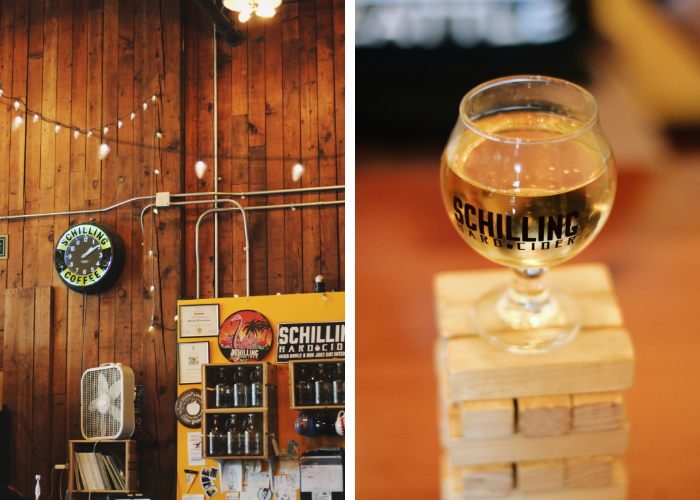 Schilling Cider House in Fremont is a great pup-friendly spot. Bring your dog inside and enjoy seasonal ciders like Blackberry Pear or Chai, cider flights, and board games. Looking for more dog friendly Seattle watering holes? 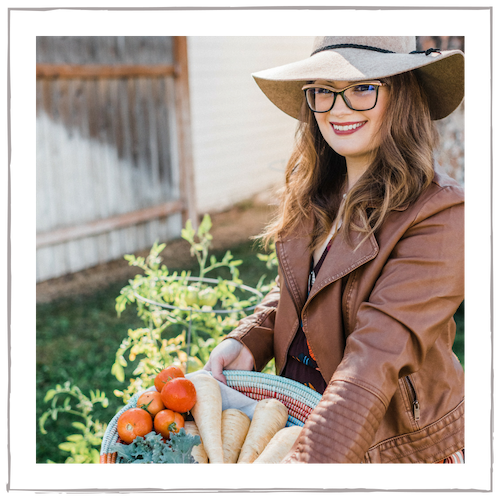 Check out Chuck’s Hop Shop, Hellbent Brewing Company, Beveridge Place Pub, and Cloudburst Brewing. 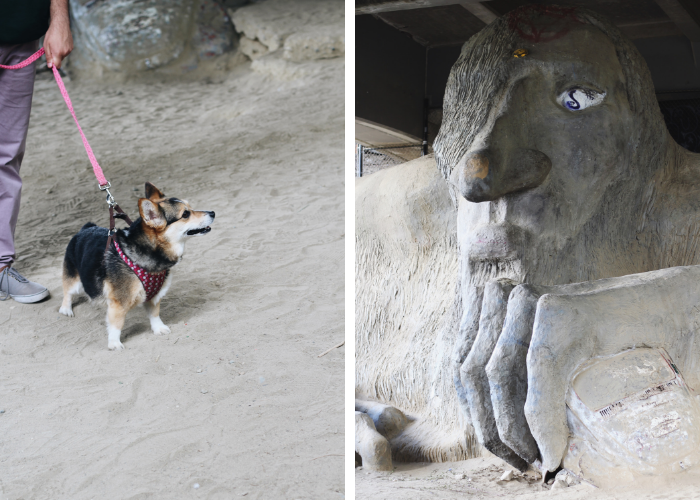 You don’t have to leave your pet at home to explore these Seattle gems. 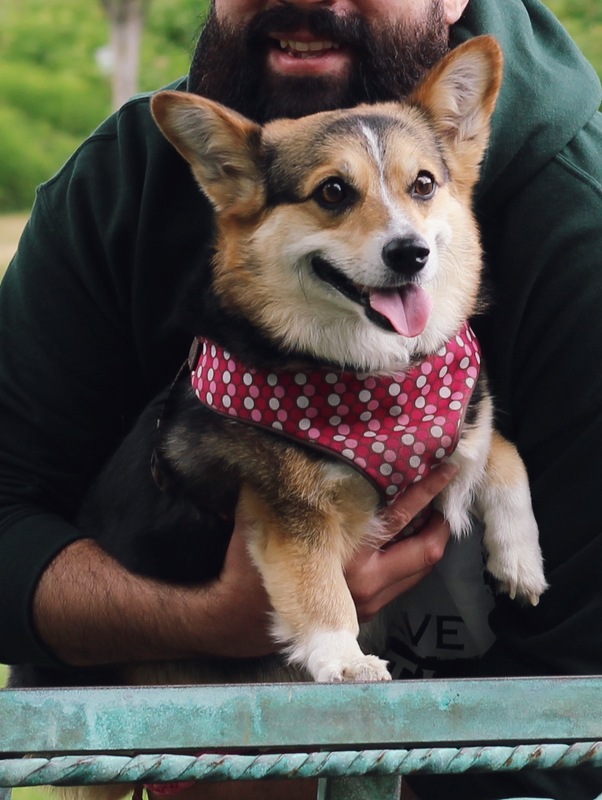 If you’re visiting Seattle during the warmer weather, you have plenty of options to have some fun outdoors with your pet. Head to CityDog Magazine’s annual Dog Days of Summer Muttmixer. You can also check out a dog-friendly pool party or the Green Lake Dog Days Of Summer Festival, which includes a 5k and Cutest Dog Contest. Have you ever taken a cruise with your dog? You can in Seattle. The year-round Fremont Sunday Ice Cream Cruise serves up frozen treats with a trip around Lake Union, and pups are welcome! Grab the pack and head to the annual Dogtoberfest in September! Seattle’s largest beer festival offers a dog-friendly day filled with 100 beers, steins, and chainsaw pumpkin carving. 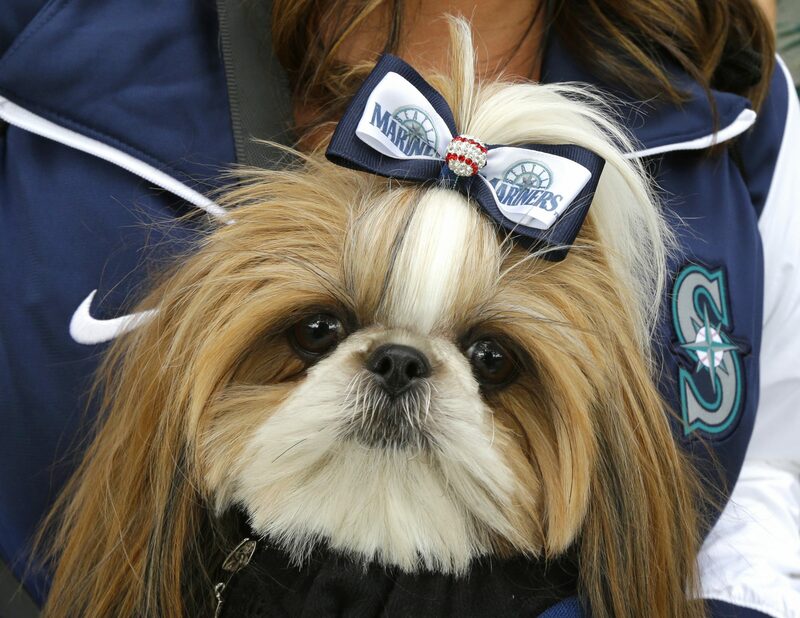 If you and your pup are baseball fans, catch a game at Safeco Field for Bark in the Park! Your ticket includes a giveaway and a postgame walk around the bases. Spend the day exploring one of Seattle’s many farmers markets with your four-legged pal. 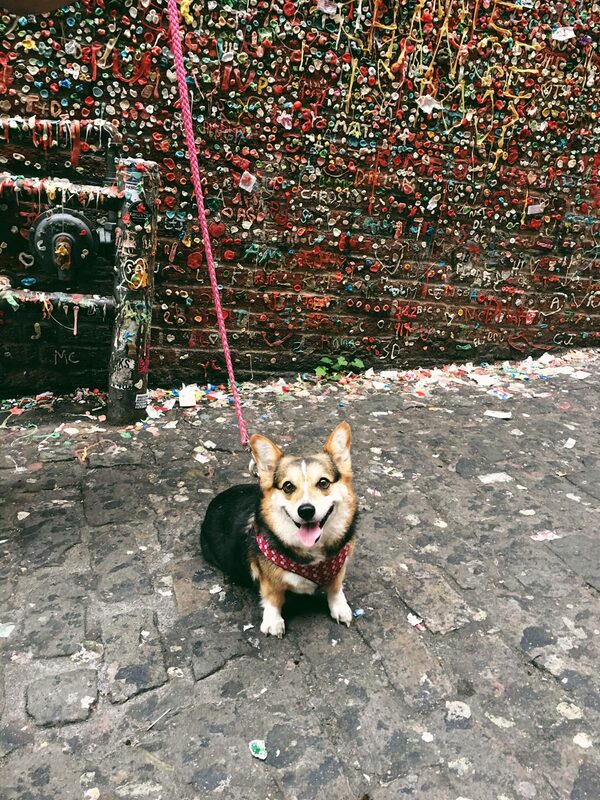 You can also explore Pike Place with your pup. Dogs aren’t allowed in the marketplace building, but welcome on the streets and sidewalks. A lot of Pike Place restaurants (like Pink Door and Tasting Room, mentioned above) are pet-friendly. There are outdoor movies all throughout Seattle when the weather is nice. And good news, most of them are dog-friendly. Grab your pup and a picnic blanket and catch a flick at one of these outdoor movie nights. 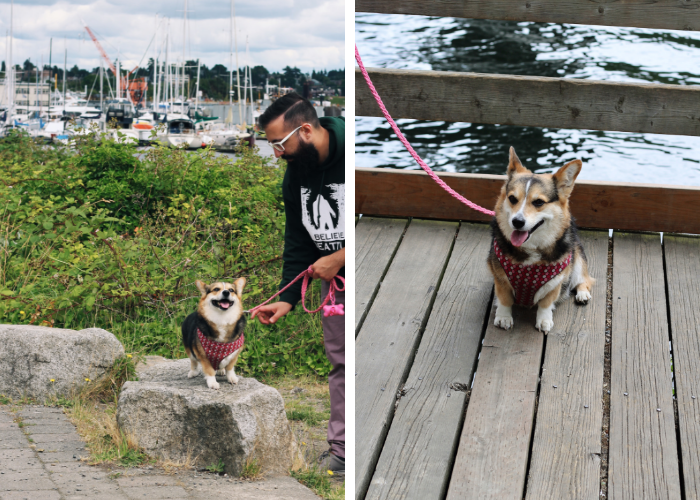 We hope that you enjoyed this Dog Friendly Seattle Guide! What are your favorite things to do with your pet? Let us know in the comments below! Are you sure King’s allows dogs? I was told “service animals only” when I enquired. On the patio! Were you inquiring about inside or the patio? What a great city Seattle is. Can you believe the snow Seattle got a couple weeks ago?! It’s nothing like the snow we have back home but I guess it really shut down the area. After reading this I would follow these tips to my dog. This is the best dog-friendly list I’ve seen! Thank you! Ooooo love it! We just adopted a puppy in September, so it’s good to know where we can take her! 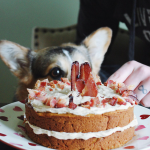 We don’t have a dog, but if we did, these are great tips. So its true I heard Seattle was very dog friendly. I never saw a doggy food truck before– cool idea. What a great guide for those who travel with their pets! I am sure this will come in very handy! Your dog is a cutie! It’s definitely helpful to find places to take your dog in the city. Our fuzzy friends like to go on adventures too! 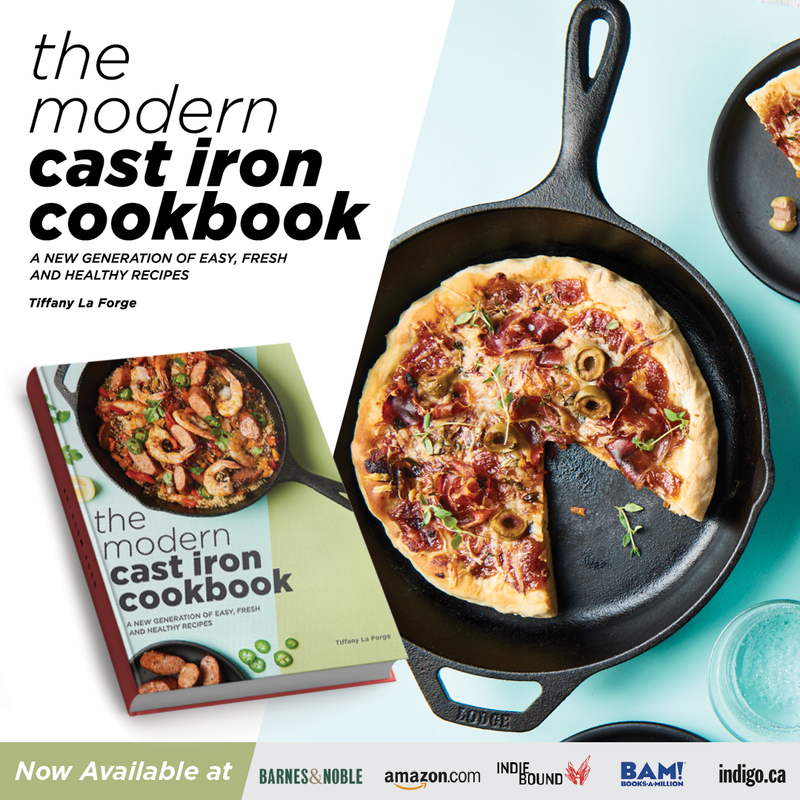 This is such a great and full guide! I never realized just how hard traveling with your furry friend could be. You really thought of everything and made future trips to Seattle with a dog so easy. Thanks! The Seattle area has a LOT of them. There are 14 off-leash areas just inside the City of Seattle and 10 or so in the surrounding areas. The crown jewel of Seattle off-leash dog parks is Magnuson Park. I don’t travel with pets but I can say that these are great guides when you are traveling with a dog and I will also share this with my friends. I am so saving your website!!! Love bringing my puppies with me on my adventures! What a cute post! Your dog is just adorable! 🙂 I am a cat mama myself, but I love dogs! Thank you so much for sharing this! I love to travel with my pooches whenever possible, so learning about dog friendly places in cities i want to visit is always great!